Is this the first glimpse of the fabled Nokia EOS? We've caught our first glimpse of what we think is the Nokia EOS, a photography-heavy handset coming from the Finns at some point this year. The photos, snapped by an anonymous source who sent them to Chinese site WPDang, show the chassis of what is supposedly the EOS alongside a Lumia 920 for comparison. 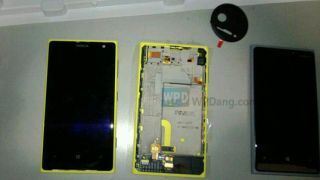 The snaps show the same body design as the Lumia 920 but with a giant round hole ready for the camera in the back panel. It looks as though the camera, rumoured to be a hefty 41MP affair similar to the one found in the 808 Pureview, will be housed in plastic rather than the polycarbonate of the rest of the body. The round camera chassis is the main difference between the EOS body and that of Nokia Lumia 920 which rocks a traditional rounded oblong camera unit. Whoever took the photos has made a valiant effort at demonstrating the handset's thickness relative to that of the Lumia 920, sadly choosing an uneven surface and slightly wonky camera angle to do so. But you can see that while the camera element is fairly chunky, the rest of the handset's chassis is about the same girth as the Lumia 920's 10.7mm. There are two small holes further down the back panel which suggest that the Nokia EOS will play nice with the same wireless charging clip-on peripherals that the Nokia Lumia 920 and Lumia 925 vibe with. Coming from an anonymous source as they do, we haven't been able to verify the photos but we like them for legitimacy - they're just rubbish enough to be real and we'd expect the handset to be fairly far along in development given the leaks we've seen already. Other mooted specs include a quad-core processor, 32GB of storage, a 720p OLED display, FM radio, Xenon flash and a debut on AT&T in the US. Today's leak posits that the handset will go on sale on July 9.